This affable but goofy gay comedy stars Jim Carrey and Ewan McGregor - A-list Hollywood stars one doesn't usually associate with the gay film genre - as two convicts who find love in jail. The film's conceit is built around the character of Steven Russell (played by Carrey), a Texas cop and Christian who has an accident one day that convinces him to change his life. One hears of such stories (the film insists, in opening credits, that this one is absolutely true). After a near-death experience, Russell emerges with absolutely no fear. No fear of coming out of the closet (he does so with the dramatic flair usually associated with Carrey, which is less queer than purely theatrical), and no fear of practically everything else. Unfortunately, that includes a life of crime, to which he seems temperamentally well suited, if unfortunately unskilled. He leaves his wife and child, moves to Miami, takes up with a handsome Latin, and begins funding his lavish lifestyle with stolen credit cards. I had an acquaintance who did nearly the same thing. Like my acquaintance, in no time, Russell finds himself in the county lock-up, where he then meets the Phillip Morris of the title: an unassuming, blond, gay innocent (McGregor, playing uncharacteristically shy) with whom he's immediately smitten. As the title suggests, this then is a love story, about how the two men fall in love, get out of jail, make a life together, and how Russell proceeds to screw it all up. What's nice about this film is that it has the mad-cap pacing of a Some Like It Hot or Bringing Up Baby, hardly the type of screwball hi-jinks one usually gets in gay film and a nice change of pace. Carrey, as Russell, proceeds to pull the type of scams worthy of Frank Abagnale, Jr., including posing as a lawyer, the CFO of a major corporation, and ultimately - and most amazingly - a patient dying of AIDS. It's hard to say what's motivating Russell, other than that near-death accident, since he seems to be throwing away everything he's found at the hands of an uncontrollable mania. He's a sociopath in the most basic sense, with no feeling for what he's doing or other people (except this romantic idea of his love for Phillip). As the movie goes on, one realizes that it's not Russell, but Phillip, who is the main character here...Russell is but the larger-than-life object of his affections, whose plots and schemes ultimately come to ruin them both. 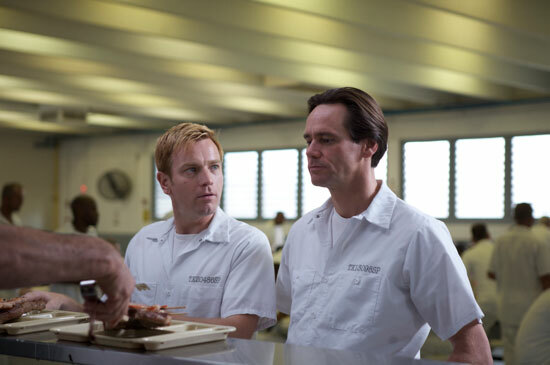 I Love You Phillip Morris ultimately has more to say about love and obsession than it does about being gay, which is why I think it's such a good film. Both Carrey and McGregor make these characters come alive, and despite how far they are from the mainstream, they're as close to real people we know as any we get in film. One would go to any length for the other, and the other has to decide just how far forgiveness can extend. That they found each other is something of a miracle, as well as a curse. Carrey's timing may be a bit too flippant for a serious comedy (though he plays the serious moments well), but the movie - odd though the story is - delivers plenty of laughs. It may also be the most interesting exploration of love - gay or straight - that we've seen from a comedy in years.